Soheli, at left, helps some of her customers pick out fabric for clothing. Through the ACT project, Soheli received psychological support, counseling, life skills training, and entrepreneurship training. On a bright, sunny morning in March, 19-year-old Soheli (not her real name) is grinning as she sorts through an assortment of fabric spread throughout the small room at her home in Vacutia, Jessore in Bangladesh. A youthful, easy laugh escapes her mouth during a conversation with some of the village women who have stopped by the home she shares with her mother, Sufia (also not her real name). Her neighbors are there to buy some of the striking, colorful fabric that Soheli carefully unfolds and holds up by the corners for closer inspection. As the sunlight streams through Soheli’s window, the sheer cloth in her hands acts as a filter, casting an array of radiant colors across the room. The scene stands in stark contrast to Soheli’s life just a few years before. Watching her on this morning, operating a successful clothing business, one would probably pick up no indication that Soheli is a survivor of human trafficking. The USAID-funded Actions for Combating Trafficking-in-Persons (ACT) program, implemented by Winrock International, is working so that this all too common problem will be eliminated from the country’s narrative. One of the details that makes Soheli’s story all the more gut wrenching is not uncommon either. It was someone who Soheli trusted, a neighbor, who betrayed her. She enjoyed visiting her neighbor’s house and talking with her two boys — even though her mother didn’t approve, and asked Soheli to stop visiting them. Soheli’s neighbor lured her with the promise of a job that would bring her income and the freedom to live without interference. Instead, Soheli was taken from her home and ended up in India, where she was handed over to two men who sold her to a brothel in Mumbai. Back home, Sufia was distraught over her missing daughter. On four separate occasions she traveled to India, searching for Soheli. She sold their home to pay for the passport and travel visas. Meanwhile, after five months at the brothel, Soheli was finally able to escape, with the help of another trafficking victim, and took shelter in a church. 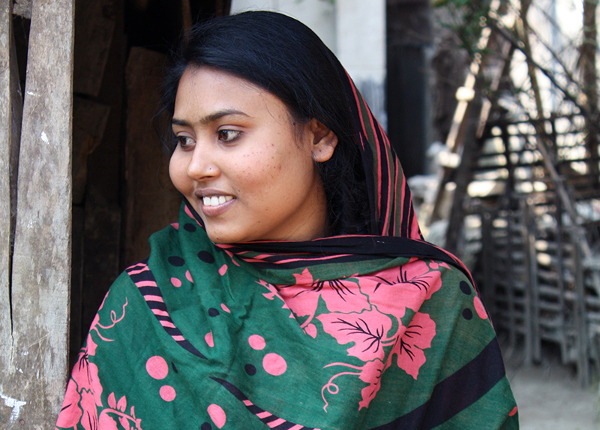 Through ACT, Soheli was assisted with returning to Bangladesh and she was referred to a shelter where she received medical treatment, psychological support and counseling, life skills training, and entrepreneurship training. As a child, Soheli had seen her mother make a living with sewing and selling fabric, and she realized she wanted to do the same. ACT helped train her to run her own business and she picked it up quickly. To help smooth the transition back to her community, ACT staff met with community members to help them understand Soheli’s situation and make them aware that their support was important, too. Additionally, Soheli received fabric through ACT to assist with her business start-up. Eventually, Soheli was able to return home with her mother, where they have worked together in their business. Soheli buys and sells the fabric, while Sufia handles much of the stitch work. Soheli’s monthly income ranges from 4,000 to 5,000 taka, although during the Muslim festival period, she is able to earn up to 10,000 taka per month. Together, they were able to save enough money to buy back their home. Even with all these successes, this is what really puts a smile on her face: the love and respect of her community.